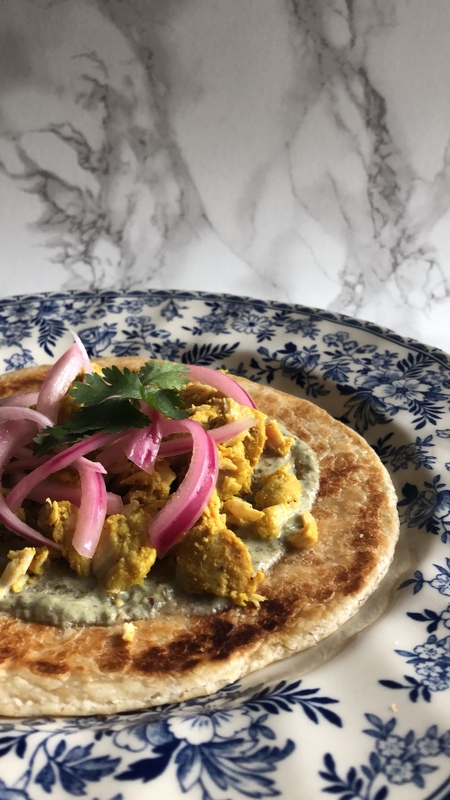 It’s Ramadan, so obviously I’m making paratha rolls on the regular, but sometimes I like to change up my recipes to see if they can pack some more flavour. So that’s what I did with paratha rolls. My old Paratha roll recipe is delicious as well, I just made a few variations. Start off by pickling the onions. The longer they sit, the better they taste. In a small bowl add the onions, water, vinegar and salt. Over and refrigerate till you’re ready to assemble the paratha rolls. You can even put them in a jar and keep the in the fridge for up to 2 weeks. Then marinate the chicken. In a medium bowl add the chicken, spices, yogurt and the ginger garlic paste and mix well. Then just cover and let it marinate for at least an hour. You can even marinate the chicken overnight if you want to prep ahead of time. For cooking the chicken, just sauce it in 2 T oil in a pan till the chicken is cooked through. While the chicken is marinating mix the yogurt, mint chutney and imlee chutney and refrigerate till you’re ready to assemble. ignore the amounts on this! it was a smaller recipe! To assemble. Prepare the parathas according to the instructions on the back. Spread some chutney on one half. Do the same with the chicken and onions. Then roll tightly and secure with some foil squares. This keeps them warm and they don’t unroll. And that’s it! If you want to see details pictures and videos head on over to instagram (fatimarana_) and look through the highlights! Hope everyone is having a blessed Ramadan, and that you’re enjoying my Ramadan daily instastories!